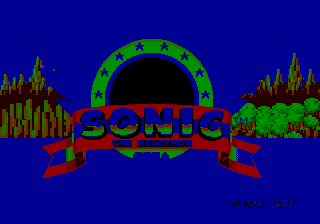 Screen fades are not treated in Sonic the Hedgehog as one might originally expect. When fading from black, blue pixels fade in before reds and greens, which in turn appear before cyans, magentas, yellows and whites (which is reversed when fading to black). While the sequence is only visible for a fraction of a second, it leads to transitions appearing to have a blue tint, with lighter pixels appearing unnaturally dark and green elements momentarily standing out. 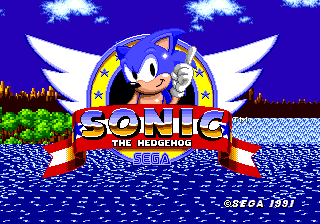 Given that the character of Sonic is mainly blue, it is not known if this was an intentional design choice (or at least, a bug left in on purpose, similar to the warp zones of Super Mario Bros.). 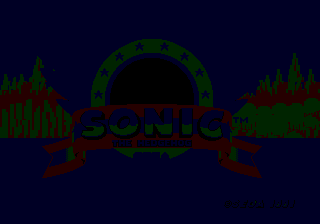 Neither Sonic 2, Sonic 3 or Sonic & Knuckles saw fit to "fix" it, and the Mega Drive has only a finite number of colours to produce a fade. Fades to and from white (used when accessing a special stage) also occur in such a way so as to give the fade a colour tint, but pixels fade more uniformly regardless of initial colour. What you see when booting up the game. Not fixed in any version. (Hacking guide fix). While the demo is playing, hold + + . This will cause the sequence of inputs to break, meaning Sonic will appear to get confused and possibly die. It's the end of the stage, let's send Sonic in for more points. Something is wrong here. We have 13230 points, but 2200+100+100+100+1000+10000=13500. When collecting the hidden points above the signpost at the end of the level, the game only rewards 10 points for the 100 point flags. After collecting a 1-up, if you pause the game as the main zone music starts to fade in, when you resume the game, the music resumes fading in but without percussion. Percussion is restored for the next music track that is played (completing level, getting invincibility monitor, getting extra life, etc.). This also affects the Special Stage theme, but in a different way: FM channel 6 is disabled because the Special Stage theme uses 6 FM channels, unlike every other song in the game. In this case, the game need not be paused for the glitch to occur; it occurs after the song fades back in.  It is however interesting to note that this cannot be reproduced in Sonic Mega Collection. This is due to an inaccuracy in the emulator, and not any fix to the game itself. 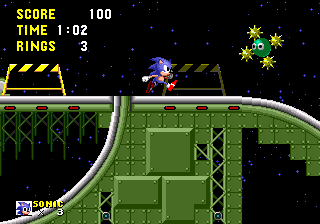 The life counter has only two digits, so if Sonic gets more than 99 lives, the graphics representing his lives appear corrupt. The game handles the number as expected - it just can't display it. 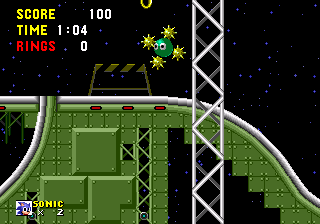 It is unusual to have this many lives in this original game as it would require the player to repeatedly die after obtaining two or more lives, however this bug persists up until Sonic & Knuckles, making it more visible with Sonic the Hedgehog 3's saving system. If the player is in the ninth minute, but he has at least one ring, the TIME counter won't flash red because of a mistake in the HUD code. here - (second post down, second video). When normally attacked, you gain a brief moment of invincibility to get your rings back or destroy the badnik that hit you. However, the spike routines don't check to see if this is true, so if you get hit on a row of spikes, lost your rings, and bounce back onto it, you lose a life straight away. This applies also to shields; so, if you have rings and a shield, the spikes will take your shield, rings, and life one bounce right after another. Note that there has been some debate over whether this behaviour was an intentional feature, but many people classify it as a bug. No official confirmation has been made either way. 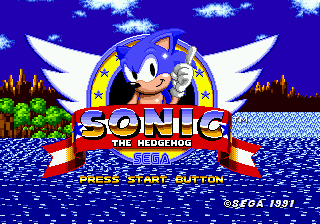 Fixed in Sonic Classic Collection. (Hacking guide fix). 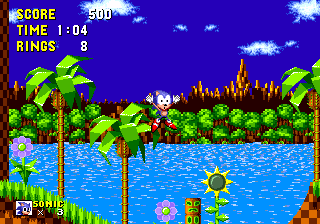 In certain circumstances, but most often when next to a solid object, jumping will use the wrong animation, so that Sonic appears to walk in mid-air. This happens often in Marble Zone whilst on the blocks that float on the lava. 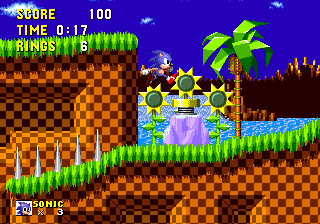 This also happens in Green Hill Zone Act 2, at the second block (the one with the yellow spring on top). On the first act there is a series of two speed tunnels with a lamppost in the middle. Occasionally, if Sonic is moving too fast the screen won't scroll down fast enough, and when Sonic touches the bottom of the screen he will die, as if it were a pit. 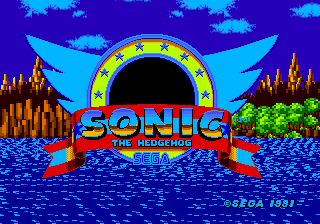 Fixed in Sonic the Hedgehog Genesis. ...and you can pass through. 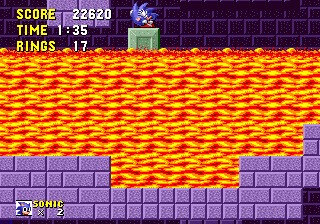 In Acts 2 and 3, Sonic is able to push blocks into lava, which can then be used to ferry him across. 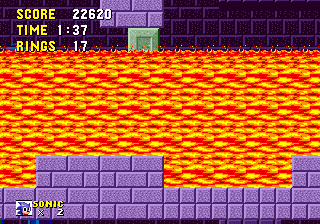 During these sections, the game expects you to jump over solid obstacles to avoid being pushed in to the lava, however ducking allows Sonic to pass through the bigger blocks without issue. Letting go of when mid-way through the scenery will cause Sonic to instantly die. At the end of the first two acts, if the camera is panned down at the moment the results screen is about to appear, the game may crash with an Illegal Instruction exception. About three quarters of the way through the first act, you will come across an Orbinaut on the upper path. Attempt to jump on it and you will die instantly. 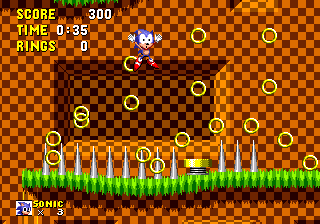 Sonic can be briefly seen rebounding and losing his rings as normal, but as Sonic moves off the top of the screen, the game erroneously registers you as having fallen into a pit. On the first act, find the ledges that move right then left. Go to the far right side of the wall and wait for the platform to move to the right. As soon as it starts to move right, duck. You'll go through the wall. While here, press to zip right and to zip to the left. 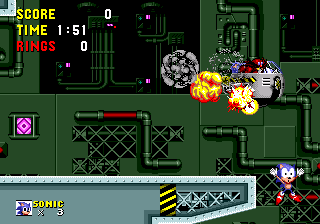 Hit Eggman at a precise point as he flies off, and it is possible to fall off the edge of the level. This is only possible if Eggman is hit, as otherwise Sonic's forward movement will be stopped when jumping near the edge. Youtube video that shows the non debug mode level bugs mentioned above. Youtube video that shows the Star Light Zone level bug mentioned above. Youtube video that shows the Labyrinth Zone act 2 level bug mentioned above. This page was last edited on 15 April 2019, at 16:20.